I had this bottle in my cellar for some months now and I decided to open it with to have it with some remaining lamb from Easter . 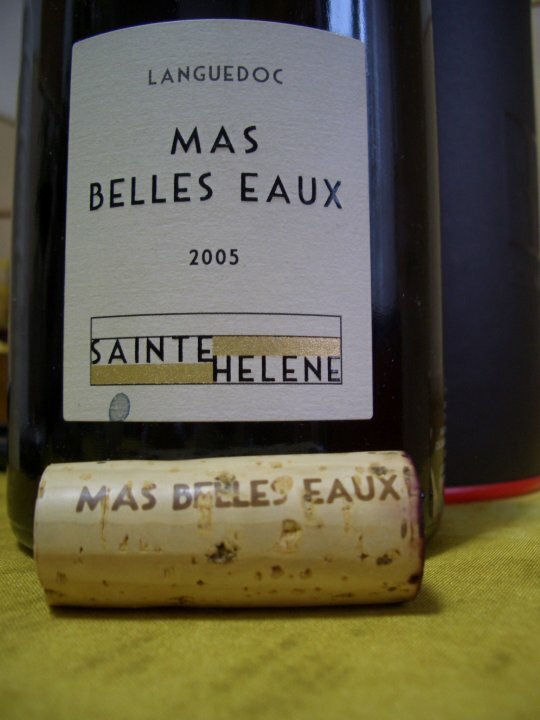 Mas Belles Eaux is owned by Axa Millesime, the same owner of Pichon Baron in Paulliac, Bordeaux and it is an acquisition made in 2002 when Axa discovered the 90 ha of vines situated Nord-East of Pezenas, in Languedoc. New equipment has been installed and the chais renovated so that wines can be properly stored and aged for long time. 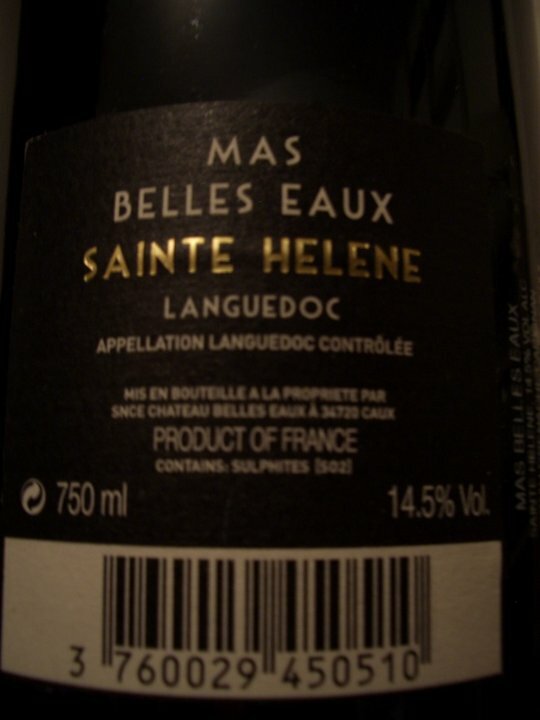 The cuvee Sainte Helene is the top wine of this estate. Very carefully selected grapes for this cuvee are coming from the plots situated on the highest point of this property. It is a blend of Syrah, Grenache and Carignan fermented in steel and concrete tanks. The maceration is long: 30 to 40 days. The wine is aged in French oak barrels, 1 or 2 years old, for 15 months. The color of the wine is deep purple. Nose: initially closed it gradually opens with notes of dark black fruits, spices and cocoa. As the wine is decanted the cocoa is the main component that comes massively and elegantly out of the glass. Oak is only giving this nose more class, balancing the cocoa component. In the mouth the wine is magic: balance between finesse and power; cocoa with crushed white and black pepper. A full body wine with a long aftertaste, nice freshness and acidity, round and polished tannins, that stay in the mouth for over 30 s. There is no sign of heat even though the wine has 14.5% alc. I will be looking for more of this wine to keep and see how it develops in time. A fabulous wine which was all reminded me immediately of McVities Jamaica Cake!